3 layers design, it can enable you to catch more fish. Layer: 3 layers. 1 Fish Net. Material: Chemical Fiber. 3 layers design, it can enable you to catch more fish. Material: Chemical Fiber. Layer: 3 layers. 1 Fish Net. 3 layers design, it can enable you to catch more fish. 1 Fish Net. Material: Chemical Fiber. Net Hole 2.3cm/0.9in 4cm / 1.5in 6cm / 2.3in 8cm / 3.1in 10cm / 3.9in Item Weight: 75g / 5.63oz. Layer: 3 layers. Lead sinkers are tightly stitched to the DOUBLE bottom line by hand, will never lose. PVC floats on the DOUBLE head lines, can be used in deep water, will never break. 1 Fish Net. Help you get more fish. Material: Nylon. 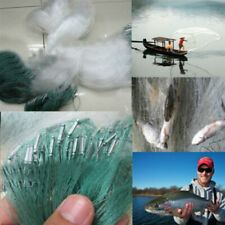 3 layers design, it can enable you to catch more fish. 1 Fish Net. Net Hole 2.3cm/0.9in 4cm / 1.5in 6cm / 2.3in 8cm / 3.1in 10cm / 3.9in Item Weight: 75g / 5.63oz. Material: Chemical Fiber. Layer: 3 layers. Nylon thread hand netting. -There is a large throwing area, very suitable for fish ponds and field use. 1x Fishing net. Material: Nylon. Detail Image. Gill Net 50'x6' 3 1/2" mesh. 30# leadline/1/4" headrope with 0-4 foam floats. Loops spliced/tied on all ends. Condition is New. 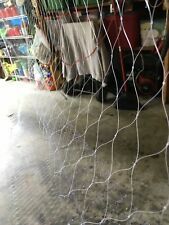 This net is rigged to catch bait such as shad/bunker or as a serious SHTF survival net. Four 3/16" x 3" poly rope soft shackles included. I've used this style net for many years and they really catch fish! This net hung by a retired commercial fisherman in Hopewell, VA.
Recyclable nylon netting, soft, limp, strong and durable. Specially design, enable you to catch more fish. Length: 30m/1181.10"/98.43ft (appr.). Height: 1.8m/70.87"/5.91ft (appr.). Material: Nylon. 1 pc of fishing net only,other accessories demo in the picture are not included! 1 x Fishing Net. Can catch a lot of fish. Material: Nylon. Layer: Single. Length: 20m/65.62ft. Lightweight and durable. Net Size：length 100 m X height 2.5 m. If you are satisfied with our product quality and service after receiving the product, and encourage us to do better, we hope to get your five-star praise. Quick sink and a tight bottom seal prevent bait to escape. 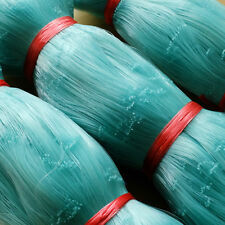 Material: Real Lead Sinker Weights ,nylon fishing line, fibre. Easy to throw. Designed especially for novice throwers. 1 x Cast Net. Portable Folding Camp Bed Aluminium Alloy Travel Tent Cot Travel Outdoor Camping. Brail fish live copy again brought out of the water, so the fish can reduce the run rate. Can also be used under good nets or bamboo beat the water still ran up the stone and let the fish play "catch fish" effect. Material: Netting Twine(Net) Steel(Sinker). 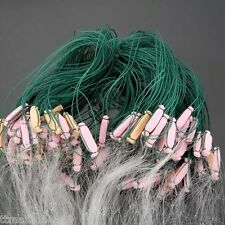 Made of high quality netting twine material,very durable,not easy broke. Hollow sinker,faster to drop into the water quickly, fishing effect is better. Material: Netting Twine(Net) Steel(Sinker). Hollow sinker,faster to drop into the water quickly, fishing effect is better. 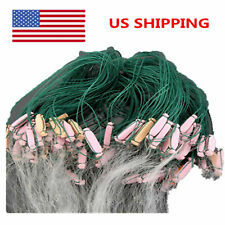 Made of high quality netting twine material,very durable,not easy broke. It's just take you 1 minute. Specially design,enable you to catch more fish. Net Size (L H):95m 1.6m. 1 X Fishing Net. 1 x Fishing Net. For fishing. -Help you get more fish. Material: Nylon. Model: 667878. -Easy to use. We will try our best to reduce the risk of the custom duties. Brail fish live copy again brought out of the water, so the fish can reduce the run rate. Length: 8M. Saw the fish hit the net do not rush the net, and other fish wrapped in prison. the stone and let the fish play "catch fish" effect. 1 Fish Net. Help you get more fish. Material: Nylon. Your satis faction is our ultimate goal. You may also like. 3 layers design, it can enable you to catch more fish. Layer: 3 layers. 1 Fish Net. Material: Chemical Fiber. Net Hole 2.3cm/0.9in 4cm / 1.5in 6cm / 2.3in 8cm / 3.1in 10cm / 3.9in Item Weight: 75g / 5.63oz. In good shape has a couple small holes as pictured. This is a heavy net with big floats and lead weighted at the bottom. Any questions please ask.Thanks for bidding. BIN is with FREE shipping ONLY in the U.S., (lower 48), unless you pay the difference. 1 Fish Net. Help you get more fish. Material: Nylon. Color: Yellow.